Every week we pull together some great Canadian recipes from Canadian food bloggers around the web featuring one main ingredient or dish. This week, we are getting ready for Christmas Cookie Swap season with 27 delicious cookie recipes! Yes, the holidays are the perfect time to forget about diets and a few extra pounds, especially once one starts receiving beautiful boxes decorated in red, green, and white, and filled with delicious cookies. For some reason, the exchange of sweet treats between friends and relatives during the holidays creates a sense of generosity that, let's be honest, feels very, very good. Plus, everyone gets to taste chewy chocolate chip cookies, fragrant gingerbread men, crumbly shortbread cookies, and sweet biscotti, among many, many other things. Getting ready for a big holiday bake-off? Then, you are in the right place because we have 27 stunning Christmas cookie swap recipes to wow your loved ones! 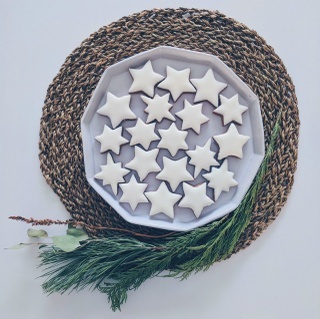 These [Cinnamon Stars](https://www.lisaposatska.com/blog/zimtsterne-cinnamon-stars) (zimtsterne in German) are chewy, nutty, spicy and have an airy crunch from the meringue, which then softly melts away. If you close your eyes, you may feel like you are sitting in front of a crackling wood fire, bundled up and lost in a really good book. From **Lisa Posatska**. These [Healthy Gingerbread Cookies](https://leelalicious.com/healthy-gingerbread-cookies/) are gluten free, paleo and clean eating! The dough even holds up to making gingerbread man cookie cut outs. With this recipe, no one has to miss out on Christmas baking anymore. From **Leelalicious**. These [Salted Dark Chocolate Dipped Toffee Shortbread Cookies](https://www.mykitchenlove.com/chocolate-toffee-shortbread/) are classic shortbread cookies upgraded with toffee pieces and dipped in dark chocolate with a sprinkling of flaky sea salt. The perfect treat for Good old St. Nick. From** My Kitchen Love**. If you are a candied fruit hater, these [Gluten Free Fruitcake Cookies](http://www.celebrationgeneration.com/blog/2011/12/14/gluten-free-fruitcake-cookies-recipe/?cn-reloaded=1) might change your mind. They are amazing! The substitution of dried fruits for glaceed, the Southern Comfort… They are a vivid palette of flavor and texture. From **Celebration Generation**. [Soft Walnut Cookies ](https://www.sugarlovespices.com/soft-walnut-cookies/)(Biscotti Morbidi alle Noci), a delicious gluten-free cookie, typical of the holidays, made with just four ingredients and a dusting of icing sugar. Quick and easy to make, you just can’t stop eating them! From **Sugar Love Spices**. These **Vanilla Bean Cookie Pops** are just DELICIOUS. Adding the vanilla bean paste just really brings out that vanilla flavour, plus the specks of vanilla bean make a plain sugar cookie a little extra special. From [Love In My Oven](http://loveinmyoven.com/vanilla-bean-cookie-pops/). Would you like an almond-based, dense, nutty, honey-flavored, lightly spiced, dark chocolate coated cookie? If you said yes, these traditional Italian [Mostaccioli di Mamma](https://www.shelovesbiscotti.com/mostaccioli-di-mamma/) cookies are a must for your Christmas holiday cookie platter. From **She Loves Biscotti**. These [​Christmas Scottish Shortbread Cookies](https://www.prairiewindslife.com/recipes/christmas-scottish-shortbread-cookies) are very sweet and you can either make them into cookies or press them into a baking pan and slice them up after. Dip them in chocolate and sprinkle crushed candy canes on top to add a Christmas touch to them. From **Prairie Winds Life**. This festive looking [Holiday Cranberry Pistachio Biscotti](https://foodmeanderings.com/holiday-biscotti-christmas-baking/) cookie makes a great edible gift and is perfect for sharing at a holiday cookie exchange. 1 Weight Watchers Freestyle smart point per serving! From **Food Meanderings**. Thanks to the addition of the citrus zest, you'll be able to turn a few non-gingerbread cookie fans into gingerbread cookie lovers with these [Orange Gingerbread Cookies](https://www.bakersbeans.ca/orange-gingerbread-cookies/). Give them a try! From **Bakers Beans**. Click on the images below to be taken to more great Cookie recipes! A big thank you to all our FBC Members who participated in this weekend's Cookie Recipes roundup. So many wonderful cookies and so little time! Great roundup. Not sure what to bake first. You have an entire long weekend to try a few! Thanks for picking my cookie and for giving me lots of ideas. Check out my 2018 treats.